Close the main ferry pier on Phi Phi Don, Amicos Restaurant is one of the key pier head venues and ideal for a pre ferry bite to eat. In the evening it has a simple charm. Backing on out directly to the sea and fronting the main street, it is one of the places to be seen on the island. The Amicos Restaurant Phi Phi menu is un ashamedly European with a series of Thai classics to round off that perfect mix that makes this type of restaurant-brassiere style so great in Thailand. 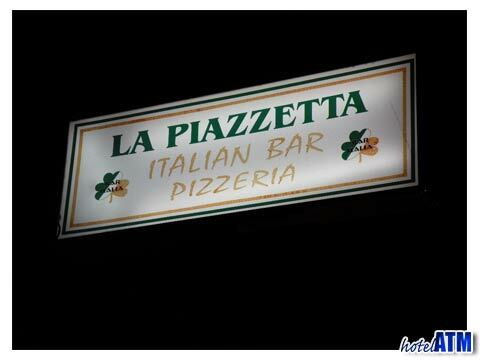 The dominant theme is Italian with tasty pasta dishes and pizzas being very popular. The steaks and burgers come with fries and salads and these contrast with the fried rice, fried noodles and other Thai snack plates that go down so well with the chilli sauces (Nam Prik). As Amicos is close to the pier it also does some great ice creams and has a formidable coffee machine that gives you everything from Americano to Espresso. Along the main street their is a continual flow of people moving into and out of the heart of the village and a seat at the front is a 'watch the world go by' type place that never seems to tire. Amicos is a long and thin floor space and the other best seats are out the back on the sea front. Here you can watch the boats bob up and down, perhaps be mesmerised by the longtail boats with their colourful head scarves, or the dive boats readying for their dive day. Amicos combines a great position with some excellent food and i well worth checking out if you are in that part of the village. It is 50 meters from the pier head. 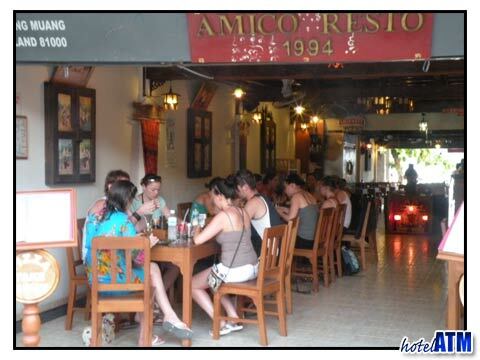 Due to the open style of seating and the general busyness of Amicos Restaurant Phi Phi, it is well used to working with family needs and often children can be seen in there. It doesnt have any child friendly games but it is more than happy to welcome families. The most obvious hotel near Amicos Restaurant Phi Phi is the famous Phi Phi Hotel whose 4 stories sea view rooms gives you wonderful rooms over the roof of Amico and onto the pier and Tonsai Bay and Phi Phi Ley. This pier head classic is central for all the water based sports and dive companies and is popular with visiting dive groups. Budget accommodation nearby comes in the ever popular Ivory Phi Phi and the Phi Phi Guesthouse Marine House, Phi Phi The Pier Guest House. More information about 'Dining on Phi Phi Island', 'Eating out on Phi Phi', 'Le Grand Blue', 'Pluto's Italian Ice Cream', 'Thai Seafood on Phi Phi Island' and more can be found at Phi Phi Restaurant Information.